Big Cats has open enrollment all year long so anyone can sign up at any time! There is a $30 registration fee each year. This fee is non-refundable. (This fee does not cover the first month’s tuition.) For multiple siblings in 1 family: the $30 applies to the first child but is only $15 for each additional child that is registered under the same parent. Tuition is due on the 1st of every month. It is considered late by the 5th and a $10.00 late fee is charged automatically on the 6th. Payments can be set up for automatic debit online or we accept cash, check or credit card payments in the lobby. Please include child’s name on the envelope & drop in the security box. There is a 10% discount for multiple classes taken per child &/or per sibling within each family. The more classes you take, the more you save! For ALL athletes entering the building: No outside shoes are permitted in the gym area (we have cubbies up front for leaving shoes & drinks - Big Cats is NOT responsible for lost or stolen items), hair must be pulled back out of the face, no jewelry or gum is allowed. Water & hydrating drinks (such as Gatorade or Powerade) ONLY are permitted in Big Cats. No sodas or energy drinks are allowed. *Sweating kids need water NOT sugar or caffeine. We sell water in the Pro-shop in the lobby if the athlete forgets to bring some. TEAM Gymnasts MUST wear a leotard to every practice. Practice shorts over the leo are fine. Shirts over the leo are not allowed for safety reasons. We encourage recreational gymnasts to wear leotards to class with hair pulled back out of their face. (Please no leotards with skirts or tutu’s as it is difficult for coaches to spot children with loose fabric.) If you want to wait a month and make sure your child loves gymnastics before investing in a leotard, that is fine. All other classes (Toddlers, Ninjas, Tumblers) can wear athletic shirt & shorts to class. Please no shorts with buttons or snaps (ex. jean shorts) and shirts must be able to tuck in when going upside down. Athletes must be able to see while doing skills without a shirt falling in their face. Socks are permitted for most activities but athlete may be asked to remove them for certain events. Athlete (& parents) are responsible for remembering socks. We do NOT put dirty socks in the lost & found anymore. We have a lost & found in the lobby of the gym. All forgotten items (except socks) will be placed in the lost & found basket. All unclaimed items are donated every December & June so please be sure to periodically check it for missing items. For liability reasons, parents & siblings (that are not in a class) are to remain in the lobby (unless using the restroom). We have ample seating plus 2 large viewing windows & a 4-way split screen TV for when the windows are crowded. We also offer a Pro-Shop in the lobby for snacks & drinks as well as apparel & accessories. *Pro-shop may not be open every day but we do our best to have it open for business as often as possible. If you have an urgent need & the shop is closed, please see a coach between classes. 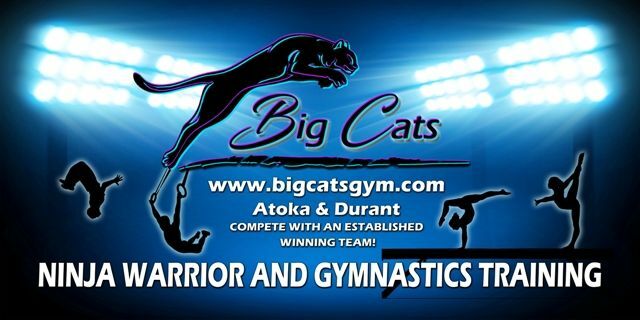 Please call (or text) 580-258-0356 or email: bigcatsgym@yahoo.com for additional questions. Thank you! !